L.A.-based designer Mimi Kim worked for an advertising company in Seoul, South Korea before moving to the states and starting stationery brand Clap Clap, a self-produced label known for its visually rich illustrations that has become cult favorite at shops like Paper Source. Recently though, Kim decided to branch out and appeal to your olfactory senses with her line of Botanical Scented Cards. Working with South Korean specialists, Kim developed small paper “Fragrance Chips” dipped in essential oils and dried before being vacuum-wrapped, sealed, and packed to preserve their scents (bamboo, geranium, fig, and hinoki cypress) over the course of shipping and delivery. Since this task is both expensive and time-consuming, she's turning to Etsy's crowdfunding community to help raise $2,000 for production of the first batch on FSC-certified, recycled card stock. 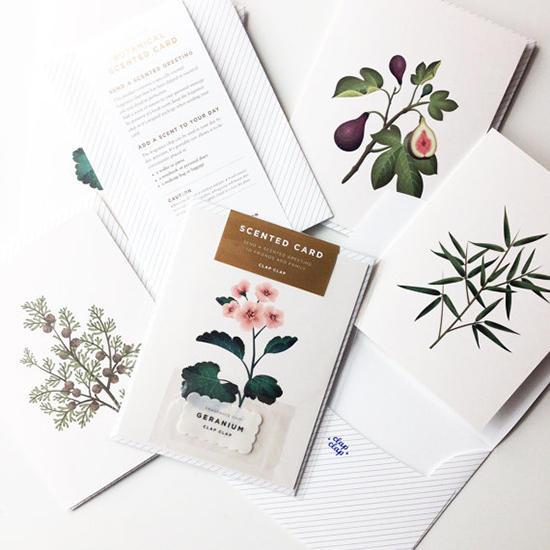 Funders will receive one Botanical Scented Card for every $6.50 pledged, or four cards for $26. Fund Kim's new products at etsy.com and shop current products at clapclapdesign.com.